This article is a brief summary of how all of our * research papers tie together to modernize the retirement income measurement from your investments. In other words, how to determine a prudent amount of retirement income. Advisers generally annually update plans with their clients. An important part of this update process is capturing new facts and circumstances to incorporate into the revised plan so the client may make prudent adjustments. Here’s the problem. The current paradigm about using Monte Carlo simulations (click for gif simulation of randomness), or deterministic calculations, and the age used to anchor thinking, adviser or client, isn’t used to the fullest capability or anchored properly. This article serves to reshape thinking about retirement income planning, in both regards, to overlooked variables in simulations and which end of the age curve to anchor perspectives. Safe Withdrawal Rate (SWR) research is sound and I want to be sure you understand I’m not trashing prior good and necessary research work that has helped shape thought and discussion. SWR represents an ultra-conservative approach determining initial retirement income. However, there lacks smooth transition between time periods (10 year, 15 year, 20 year, etc.) in the SWR modeling methodology other than using Guyton Decision Rules for adjustments to this initial income so as to adjust subsequent income at later ages once retirement income has started. This lack of transition often leads to a second observation I’ve made – that all the time periods tend to be anchored on an arbitrary “old” age such as age 95. What is the likelihood your retiree would live to, or for that matter, outlive age 95? This too is an ultra-conservative approach. Both ultra-conservative applications combined leave a lot of spendable money during the retiree’s lifetime with income basically held in reserve because of fear. Let’s talk about what I call a Dynamic Updating approach that models what people do in real life so that you may have a sense of what is a prudent income at any age built upon simulations that actually model yearly transitions by modeling and simulating multiple connected periods. The beauty here is, that once you understand the outcomes and conclusions, you realize that your single period simulation, or calculation, tells you more than you realize! What are common variables for retirement income planning? One is the time period over which the income is needed. Another variable is some sense of how many simulations successfully fund that period. However, both of these characteristics are given back seat to what many perceive to be more important – returns. And both of these characteristics provide key and important decision signals when once understood. Both characteristics are tossed out as ancillary byproducts when concentrating on what is thought to be the key variables (returns and withdrawal rates). Let’s talk about the perceived more important variable, returns, which are actually related to another variable sequence risk, before talking about the more important variables of probability of failure and distribution periods. First, there is a common impression that returns sequence risk goes away after 7 to 10 years during the distribution phase of the portfolio. We demonstrated this is not the case. (1) The misperception comes from using static data based on a single starting point which is then extrapolated into the future for 7 to 10 years. Retirees don’t refer back to prior years for their retirement income; they look at the current year and worry about the future. However, similar to expected longevity (discussed below), that future time is always ahead of the retiree. If you think about the last three annual reviews that you’ve had with your retiree, the third being this year, those past three would appear to be similar to Figure 1 at age 68, where ages 66 and 67 are in the past and ages 69 and 70 are in the future. You’ve updated their portfolio value and age each year and re-ran the simulation. Each year you see the common dispersion of possible portfolio values, but instead in Figure 1, it is the cash flow dispersion that is as each simulation set’s starting point (ages 66, 67 and 68). Looking ahead at possible future cash flows you can see how subsequent years are affected by prior years and also see that the sequence risk dispersion will always be present regardless of age. When the retiree looks at their current age, that dispersion of uncertainty is always present regardless of age. With greater return comes greater volatility in those returns. Thus, when reaching for returns there is a double edged sword where one is not certain of getting those returns, but certainly is assured of getting the volatility. We can’t escape sequence risk because that future time period, based on the present, is always in the future. In other words, the future of the markets is always uncertain, and thus sequence risk is always present. You can’t choose to ignore it by using data and results that are a few years old. When you run new data, you get the same dispersion of uncertainty into the future. Figure 2 shows how volatility takes away from withdrawal rate what one would expect to get from returns. For example, let’s select 50% equity as a reference point. Higher equity allocation has a greater withdrawal rate dispersion as compared to lower equity allocation. The possibility of failure (POF) rates, or what Michael Kitces elegantly re-frames as possibility of adjustment, is simply a representation of higher withdrawal rates that result from higher POF rates. Higher POF rates result from the retiree spending the same amount even though the portfolio value has declined due to either market forces or additional spending beyond their monthly spending needs. Withdrawal rates and POFs rates go hand in hand in a directly connected fashion (and possibility of success is inversely related to the withdrawal rate). I will discuss the POF variable more below. What is POF – simply stated, this is the percentage of simulated future markets using random returns that fail to reach the end of the time period simulated (the success rate would be 100% minus POF). We investigated sequence risk signals (2) in a paper that first develops a three-dimensional look at data across time, allocation, and withdrawal rate so that a valid comparison could be made between all the variables of time, allocation, withdrawal rate and POF. 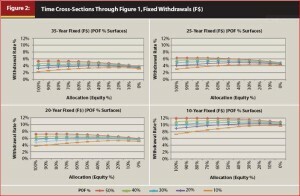 The graphs in Figure 2 show that withdrawal rates across allocations are generally flat in nature, suggesting that allocation has a small effect on the withdrawal rate — although not quite as small as commonly thought. What has a greater effect is the time period for the distribution. The shorter the period, the higher the withdrawal rate. And note – a rising withdrawal rate corresponds to a rising POF rate. If the retiree does not adjust their spending, they risk spending the money too fast relative to their present portfolio value. The question in the past has always been – How high can the withdrawal rate go? Our research suggests action should be taken at or before a 25% POF, which translated into Kitces reframing, means the likelihood of needing to adjust spending has risen. Therefore, POF – the often overlooked variable – is a strong signal that spending should be adjusted (not allocation which has a weaker effect on outcome). Our research also looked at making allocation adjustments, however found that such market timing after the fact is not effective. You can see that as well in Figure 2 by looking at how little the withdrawal rate/POF combination changes when you move along any of the allocation options within any time period. Once again, those relatively flat curves that don’t change the withdrawal rate very much at any given POF rate. 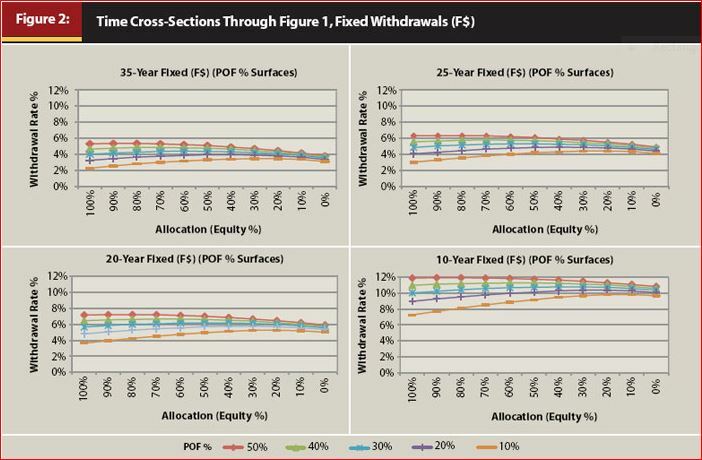 Figure 2: How Time Affects the Withdrawal Rate and POF Signals Trouble Source: Larry R Frank Sr, MBA, CFP® (click on photo to enlarge). Dynamic Updating is where we model simulated annual reviews. Rather than doing a single Monte Carlo simulation or calculation, a series of simulations are strung together because a single simulation does not adjust future distribution periods for aging. Each subsequent simulation is adjusted for aging one year (one year is removed by aging a year, however, the end age adjusts by only a few months older – i.e., there is not a one for one exchange for beginning age and ending age to the time periods). Period Life Tables (example: from Social Security tables) may be used to set the length of each simulated distribution period you use in your simulations or calculations. Note that any Period Life Table may be used; however understand that they are essentially subsets of the same population – so the differences tend to reflect healthy population subsets such as the Annuity Tables versus what may be called the general population subset that Social Security data provides. Three such simulation periods are illustrated above in Figure 1 and each are connected to results (cash flow and portfolio balance) of the prior simulation. The result of connecting simulation periods together combined with use of period life table determined time periods is a better understanding of both potential cash flow and possible portfolio balances throughout the projected lifetime of the retiree. Dynamic Updating lets us segue into the discussion of the characteristics I believe, based on our research observations, that are more important in retirement income planning: distribution time determination and success rates of simulations. Key determinant: How long will the portfolio be distributing retirement income? The time period for retirement income is the first key variable that is ignored or given very little consideration. The first key consideration is to determine the retiree’s expected longevity given how old she is right now. 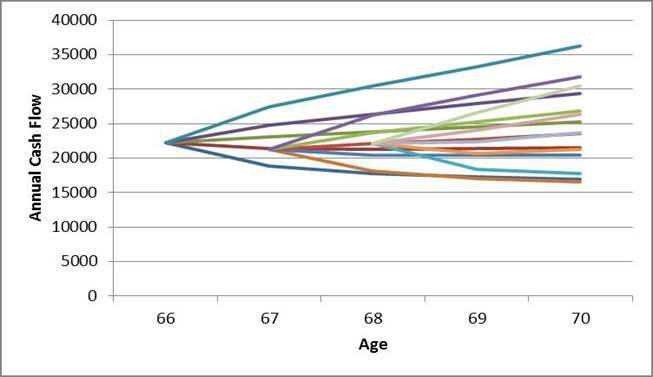 We start with the Period Life Tables to determine the retiree’s current expected longevity. The concept of “current expected longevity” incorporates and combines two sets of uncertainties into our calculations, what I call the two simultaneous probabilities: probability of the markets (sequence risk) and probability of the person (expected longevity). This combination of BOTH unknowns had not been combined into one model before. The 3D methodology combines both of these probabilities into a unified concept for better understanding how withdrawal rates slowly change with age and what are signals based on present age that spending may be getting too high (or be lower than necessary). The most common error is to fix the length of distribution periods to the retiree’s current age. For example,using 20-, 25-, or 30-year periods based on how old the retiree is now. This is a subtle change in perspective, however using fixed periods based anchored on the current age ignores how to better determine how long the period should be. 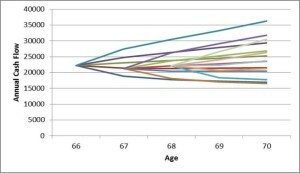 Rather, the length of the distribution period should be based on the difference between the retiree’s expected longevity age, determined from a Period Life Table, and their current age. The first thing this does is to set, and anchor, the length of the distribution to the retiree’s rolling estimated end age. Then, through Dynamic Updating, we continually adjust the distribution period, during each subsequent annual review, to their rolling expected longevity age (as in sequence risk, one never gets to the expected longevity age based on their current age — it is always older than the person is now by definition). Also, more advanced used of percentiles within the Period Life table are insightful as well — for example, you can gauge the likelihood that a retiree may outlive the number of years. For example, a 70 year old female has approximately a 16 year expected longevity (Life expectancy is by definition an arithmetic mean where 50% outlive, and 50% fall short, of the period). If she were to use a 15 year distribution period she would have approximately a 60% chance to outlive that period. If she wanted to plan to age 90 (a 20 year distribution period), she would have approximately at 38% chance to outlive that time frame. As you can see in Figure 2, the length of time in the distribution period is the main determinant of the withdrawal rate. It is not some magical allocation mixture. You may see this yourself by changing just the distribution period length in your own Monte Carlo software and see that the withdrawal rate will change, given the same allocation and targeting the same POF rate (or alternatively the percentage of simulations that succeed, which is essentially 100 minus the POF rate). The next significant determinant is the percentage of simulations that succeed (or fail), i.e., POF. Allocation, or returns, has the least significant effect on the withdrawal rate. Figure 2 thus demonstrates what most understand: A higher withdrawal rate translates into a higher probability of running out of money, either due to too much spending, a market decline, or both. The probability of running out of money, or POF, is the second key variable that is ignored or given very little consideration. In reviewing the withdrawal rate alone, the tendency is to try to get as high a withdrawal rate as possible. However, the question becomes how high is too high? Our paper (5) showed that spending adjustments resulted in higher withdrawal rates. But, these results were based on using withdrawal rates as the measure of point of reference. Thus, the results represent improved cash flow that could only be viewed through higher withdrawal rates due to the design of the model – a model design based on a single simulation period and one that is prevalently used in the profession. Hidden in the data and results was how would results compare if probability of failure formed the point of reference? Would withdrawal rates vary? Figure 2 displays the results and you can see that a rising withdrawal rate corresponds to a rising POF rate. Here now is the answer to the question, How high can the withdrawal rate get? Thus, when markets decline and the retiree’s portfolio value goes down, given the same spending rate, you will see that the withdrawal rate goes up. If you run the fact pattern for your retiree in Monte Carlo software and compare their old POF rate to their present POF rate based on the lower portfolio value, you will see that the POF rate is now higher. How high is too high? When the retiree isn’t comfortable with the possibility of not having excess funds later (Kitces again). What can they do? Reduce their spending until the possibility of adjustment is once again lower and in their comfort range. Our research found though, that once POF rates approach 25% to 30%, subsequent failure rates are very close together which means it would be very easy to tip from 30% failures to 50% failures or higher with very small portfolio value changes. Not surprisingly, when the withdrawal rate goes up (or down) based on a set dollar amount of income distribution, sequence risk makes sustained spending at that same clip more (or less) risky. Intuitive you may say — yet usually this is not incorporated into the Probability of Failure (or Success) variable. I say this because most research hasn’t concentrated on the failure variable specifically other than as a side variable. I suggest POF is the main variable to watch once the time period has been determined. Finally, three more points on the overall Dynamic Updating concept. Each point demonstrates how important time period selection or POF rates are important. The first is that any age-based distribution method — such as the one presented in the 3D model or the RMD-based model (which Pfau finds has more of a taxation agenda than a longevity agenda – 1st blog comment) — shows the exponential growth of withdrawal rates at later ages, in other words, the size of the increase between last year’s withdrawal rate and this year’s withdrawal rate grows faster and faster with age. Thus, we looked at how to mitigate that exponential nature and found that by simply adjusting the withdrawal rate down by (1 – 1/n) [i.e., WR% times (1-1/n)] helped to preserve portfolio values into older ages. (6) For example, at age 70 the withdrawal rate may be 5.08%; at 75, 5.72%; at 80, 7.04% and 85 8.92%. The difference between 75 and 70 is 0.64%; between 80 and 75 is 1.32%; and between 85 and 80 is 1.88%. Applying 1-1/n to the above withdrawal rates, where n is the annual adjustment based on the time remaining in the period life tables, the age 70 withdrawal rate is 4.88%; 75, 5.45%; at 80, 6.60%; at 85, 8.18%. The withdrawal rates are lower, thus preserving portfolio values for spending in later years. The differences between the rates are also smaller (0.57%, 1.15%, and 1.58% respectively) demonstrating that small adjustments to withdrawal rates have a huge impact on how much remains in the portfolio. All of these rates are based on a 10% POF rate – thus you can see how time impacts withdrawal rates and vise versa given the same allocation and POF. Thus, this example shows that withdrawal rate is very dependent upon POF and the time period that practitioner’s use in their simulations or calculations. Without good understanding of the POF and time inputs, given little attention to thought and importance, the withdrawal rate output is of little value. POF is a signal that the possibility of running out of money is rising. The time frame needs to be compared to a valid reference – that reference being the possibility of the person outliving that same time frame. Both factors go hand-in-hand to establish a meaningful withdrawal rate. Secondly, the main advantage of the Dynamic Updating model is to better track cash flow and portfolio balances that incorporate updated distribution period lengths. You see, the final distribution year is not one year long; it is as long as the difference between the current age and expected longevity age, typically many years still remain unless the retiree is approaching or over 100. When using a single simulation period, the last year is one year long and this results in distortion of withdrawal rates and portfolio values. This time period measurement difference has an improved effect on cash flows and balances that single period simulations or calculations don’t factor in. To justify self-managing her portfolio, the retiree needs to have a comfort level with the equity allocation required to do better than a SPIA, and a sense of not likely being in the group of long-lived cohort. The current low interest rate environment suggests that encouraging the purchase of SPIAs prior to age 80 may be misplaced. Using the appendix referenced in the last point above, a practitioner can use a simple single simulation Monte Carlo program and replicate the cash flow and balance tracking methodology that underlies Frank, Mitchell, Blanchett and Pfau research insights through the use of the article’s appendix section’s steps. Why do this replication? Because, the practitioner would get insights not seen by doing just a single simulation, insights described above throughout this article. Third, and last, the Dynamic Updating model can compare itself to the Safe Withdrawal Rate discusses a method to incorporate forward looking behavioral decision rules to aid the retiree each year. The comparison is essentially looking at time periods as discussed in the longevity section above and look at the probability that the retiree(s) may outlive periods demonstrated using your Monte Carlo software more effectively, by incorporating insights you get from period life tables, and general time periods the SWR method uses. The article also shows how you may pre-calculate a portfolio value and attach a decision to that value. Thus, the retiree(s) don’t need to panic when commentators are talking about down markets; you’ve already provided them specific values and decisions ahead of time when their emotions were cold instead of hot. The method described above provides both planner and retiree an ability to measure and monitor prudent income each year. How does one get comfortable with uncertainty? Through establishing a prudent income for the coming 12 months, develop some evidence based decision rules for when markets misbehave during the coming 12 months, and update the values each year. 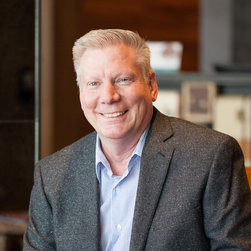 The model is built upon smoothly transitioning the retiree from one year to the next. As the retiree ages, the withdrawal rate may increase a little because the time remaining grows shorter. Thus, principal may be slightly consumed over time because there is less time remaining for larger past principal amounts to no longer be required. Joint couples may use both longevities to derive a joint expected age to determine the distribution period. Nothing in SWR method suggests when and/or how to transition and adjust withdrawal rates for later (shorter) time frames; shorter time frames that would correspond to older ages. Monte Carlo has not been trusted by some possibly for recognition of how much withdrawal rates may vary and an inconsistent measure of how to interpret them. Our research set, described in the paper series, establishes some set of standards with which to standardize and set the simulation time frames and how to distinguish one withdrawal rate from another based on evaluating the percentage of simulations that fail. Working the problem in reverse, a practitioner can also use the retiree’s present withdrawal rate and input their current time remaining by reference to a period life table, and evaluate the resulting percentage of simulations that fail (100 minus success rate) as a signal to how close the retiree is to running out of money before running out of life. Logical yes, however there were no established POF reference points based on research versus those of emotion. Those based on emotion tend to be conservative, in other words, no possibility of failure to 5% failure rates for example; and over what time period? Often a failure rate randomly chosen to be conservative as well. The use of a specific distribution period each year, in sequence just as one ages through time, also means there is always a portfolio balance for subsequent years, unless one spends more than the prudent withdrawal rate suggests. Retirement income is not a set and forget affair unless the retiree only has Social Security and/or pension income over which they have no say, and no portfolio value for income purposes. Any amount of financial assets requires an annual review to determine what is prudent based on the current set of facts and circumstances. The Safe Withdrawal Rate perspective is based upon a premise that adjusting spending during retirement is undesirable. Thus, this requires overly conservative assumptions and leaves spendable money on the table just in case. The Dynamic Updating method recognizes the value of prudently spending some money while one can. However, in order to do this, some spending adjustments are likely needed on the margins assuming the bulk of a retiree’s income may come from Social Security and/or pension. [A comparison between the two approaches may be found in summary paper link #7 below]. The Dynamic Updating method provides earlier and more precise spending signals as compared to the Guyton Decision Rules. * I’ve been fortunate to have very talented co-researchers over the years working with Dr John Mitchell, professor of finance at Central Michigan University, David Blanchett, head of retirement research for Morningstar Investment Management,and Dr Wade Pfau, Professor of Retirement Income at American College, each of whom have brought key insights and skills to the various research projects summarized above. Photo source: By Ipipipourax (Own work) [CC0], via Wikimedia Commons (click link for gif action). 1 “The Dynamic Implications of Sequence Risk on a Distribution Portfolio” .